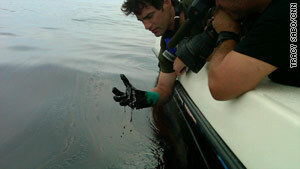 CNN's Rob Marciano on Wednesday tours areas affected by the recent BP oil spill. (CNN) -- The Gulf of Mexico undersea gusher is the largest oil spill in United States history -- possibly already more than twice as big as the Exxon Valdez spill, government estimates suggested Thursday. Scientists observed 130,000 to 270,000 barrels of oil on the water's surface on May 17, and think a similar amount had already been burned, skimmed, dispersed or evaporated. That would mean 260,000 to 540,000 barrels had leaked as of 10 days ago. The Exxon Valdez leaked about 250,000 barrels into Alaska's Prince William Sound in 1989. The busted well is spewing oil at a rate of at least 12,000 to 19,000 barrels a day, U.S. Geological Survey chief Marcia McNutt told reporters Thursday. A barrel of oil has 42 gallons, so that's 504,000 to 798,000 gallons a day. That's more than twice as much as previous estimates, which put the rate at 5,000 barrels, or 210,000 gallons, per day. It's also the more conservative estimate of two reached by two separate teams of government scientists who used two different methods, McNutt told reporters Thursday. One team looked at the oil on the surface and came up with the estimate of 12,000 to 19,000 barrels per day. A second team used a different method and came up with a range of 12,000 to 25,000 barrels per day, McNutt said. The official estimate uses the range where the estimates overlap. The lower end of the government estimate -- 12,000 barrels per day -- would mean that about 18.6 million gallons of oil has been spilled since the April 20 oil rig explosion that started the leak. The higher end -- 19,000 barrels per day -- would mean 29.5 million gallons has been spilled. The Exxon Valdez spilled about 11 million gallons of oil. Worldwide, there have been more than a dozen bigger oil spills than the Gulf spill. The worst was the destruction of Kuwaiti terminals and tankers by Saddam Hussein's forces during the 1991 Gulf war, which spilled 240 million gallons, according to the Oil Spill Intelligence Report. The amount of oil spilled could have very specific financial ramifications for BP. If the government finds the company negligent or the leak avoidable, BP will owe royalties on the lost oil, Minerals Management Service spokesman Nicholas Pardi told CNN. "Now we know the true scale of the monster we are fighting in the Gulf," said Jeremy Symons, senior vice president of the National Wildlife Federation. "BP has unleashed an unstoppable force of appalling proportions. It's as if two Exxon Valdez tankers have already run aground, and more are on the way if they don't get this hole plugged. "This independent government estimate shows what we expected all along -- BP cannot be trusted, because every gallon of oil that is spilled means they will pay more in fines and liability," Symons said. The estimates are preliminary and based on new methodologies, McNutt said in a teleconference. The first team, which got the lower estimate, analyzed how much oil was on the surface of the Gulf of Mexico on a given date, using aerial imaging. They estimated that "130,000 to 270,000 barrels (were) on the surface of the Gulf of Mexico on May 17," McNutt said. "We estimate that, in addition, as of May 17 a similar volume of oil had already been burned, skimmed, dispersed or evaporated," she said. That led those scientists to the range of 12,000 to 19,000 barrels per day. The second group used video observations to arrive at the higher figure. The scientific teams were composed of federal scientists, independent experts and representatives from universities around the country, McNutt said. BP, which owns the well, was not involved except to provide raw data, she said. CNN's Richard Allen Greene, David Mattingly and Courtney Yager, and CNN Radio's Lisa Desjardins contributed to this report.